Here are some of the best sales and discounts on cookware and kitchen appliances we found online. Official summer is just around the corner, but you don't have to wait for sunny weather to grow your own vegetables and herbs. This Miracle-Gro AeroGarden Bounty with Gourmet Herb Seed Pod Kit comes with basil, chives, thyme, dill and mint seeds. The whole kit is on sale today for $235 (reduced from $280). We don't know about you, but all through the trendy health crazes over the past decade, we've never given up on fresh bread. Make your own with this Breville Custom Loaf Bread Maker , which is on sale today for $197 (down from $380). Getting stella sous vide results doesn't have to cost you an arm and a leg. This Wancle Sous Vide Precision Cooker is priced down to under $110 (reduced from $260). It's Amazon's bestselling new release in the category. No need to wait out the rain in order to grill your favorite foods. This Oster DuraCeramic Reversible Grill and Griddle features a griddle side for brunch pancakes (and other stuff, but really, let's face it, pancakes) and a grill for all your other goodies. It's on sale today for $68 (reduced from $100). One of the most attractive things about the pourover coffee experiences is the breadth of accessories that go along with it. In particular, I'm fond of the gooseneck kettle. This Electric Gooseneck Kettle for Pour Over Coffee and Tea holds and entire liter of water. It's on sale today for $39 (reduced from $100). Looking for a new set of serving utensils? The matte-ness of this Knork 5 Piece Matte Serving Set makes for a cool new modernist twist on a utilitarian tabletop staple. It's on sale today for $40 (down from $53). Coming up with the perfect hostess gift for all the house and garden parties you're planning to go to this summer shouldn't be a chore. Stock up on these Rabbit Wine Opener Corkscrew Gift Set , which comes with the opener, bottle plug, aerator, and more, all beautifully gift-boxed. It's on sale for $35 (down from $70). 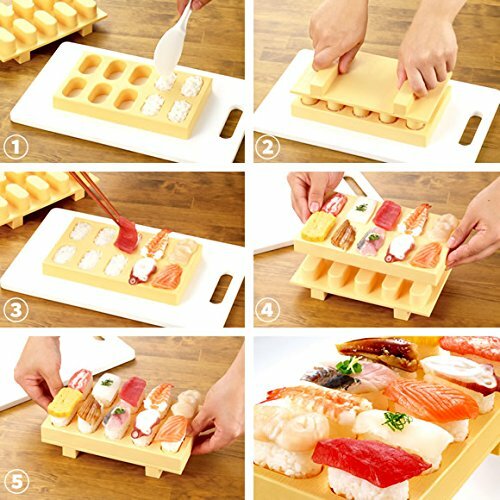 While I'm not entirely clear on why you would need this specialized tray to make sushi (like, just put the fish on top of the rice), it is a cute gadget—and definitely has a "surprise" serving element down pat. This Tobidase Osushi Japanese Style Sushi Making Plate is on sale today for $22 (down from $74). You can never have too many cutting boards—especially if you are planning on cooking outdoors this summer and need to have some near your grill. This Francois et Mimi Set of Three Cutting Mat Boards is currently on sale for $8.22 (down from $10.95). If you've run out of space on your countertops and in your cabinets to store geometrically challenging objects such as lids, consider going to your doors! This Organize It All Cabinet Door Lid Rack is on sale today for $10 (down from $15).